Record of payment for this temporary decoration by Rosso is contained in Florence, State Archives, Otto di Pratica. Deliberazioni a partiti, condotte e stanziamenti, 11, fol. 93-93v. Et pace et gaudio all’universo porta. From these sources it cannot be known what the nature of Rosso’s “ornamento” was for the “gabellino” (the custom officer’s station) and for the area “tra la porta [di San Gallo] et antiporta [di legniami].” Masi indicated that the “porta” and the “antiporta” showed scenes and figures painted on canvas from the Old Testament. Ciseri, 1990, 142, suggested, from Nobili’s sonnet with its reference to Mars “dispogliato dal valore / Qui mostra la virtù suo bel colore / Portar l’uliva et non cercar più ghuerra” and with reference to the intention of Leo X’s meeting with Francis I in Bologna, that the triumphal arch may have been decorated to present a program of Peace. One may also wonder if Nobili’s reference to Mars indicates that the decorations at the Porta San Gallo showed ancient subjects combined with those from the Old Testament mentioned by Masi. It can probably be assumed that Rosso’s paintings were related to a program that embraced all the parts of the ensemble at the Porta San Gallo (Fig.Porta San Gallo). It is not necessary to conclude that he provided only ornament, as “ornamento” is also used to designate what Sansovino created, which, aside from architecture, was most likely sculptured figured reliefs. But just what it was between the Porta San Gallo and the wooden “antiporta” that received Rosso’s paintings on canvas (ornamento) cannot be determined from the published records. 1 From Ciseri, 1990, 275, Doc. XXXVII. See also Franklin, 1994, 29, 297, Appendix A, DOCUMENT 9, giving the date 18 January 1516, that part of the document that pertains to Rosso; Franklin describes the work as “minor decorations of the customs house at the San Gallo gate and the space between the inner and outer door of that same gate.” But while the old and massive Porta San Gallo was made of stone, the antiporta, according to Masi (see below) was of timber construction. 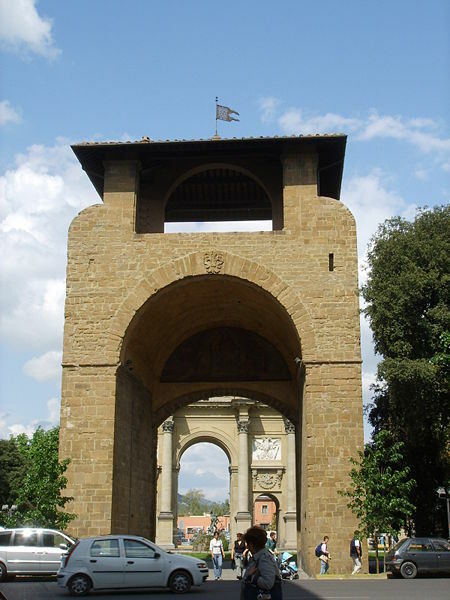 The location of the triumphal arch in relation to the Porta San Gallo may have been close to the site of the arch erected in 1738 for the arrival of Francis of Lorraine and his consort in January of 1739. The antiporta would have been in the space between the Porta San Gallo and the triumphal entry built for the pope’s entry. 2 On Masi’s Ricordanze, see L.12; the passage here is taken from Ciseri, 1990, 209-210. 3 For Nobili’s longer poem to which this sonnet is attached, see L.12; the sonnet is taken from Ciseri, 1990, 313.